Au moment où l’on parle du désarmement des rebelles hutu rwandais des FDRL et de leur éventuel bombardement, le professeur Stanislas Bucyalimwe Mararo démontre que l’entrisme des Rwandais au Kivu est aujourd’hui la source de tous les malheurs que connaît cette région. – Volume II : The 1996/1997 Invasion of the « Tutsi Without Border » and the Remote Reconciliation in North Kivu. « The motive behind the choice of the topic is threefold: to bring to the fore the discrepancy between the propaganda we were fed and the harmful situation we lived in for years, to discuss the impediments to peace and stability in the region today, and to show who did what in this twenty-one-year-old (March 1993-March 2014) and devastating war in North Kivu. In this last case, I will stress the leading role of the Tutsi who, paradoxically, present themselves as sheep and victims. I call it a strategy of self-sanctification. By doing so, I give credit to Guy Diomi Ndongala’s 2010 conclusion: “The creation of a Hima-Tutsi empire gravely jeopardizes the pacification of the DRC, they who surpassed their Judaeo-Christian masters in cynicism and cruelty”, the “coupeurs de tête modernes”/the most killers of the modern times (Manlio Dinucci). Today in March 2014, the DRC is, in principle, embarked on the path to post-conflict reconstruction and development; and yet, there is no good news to celebrate or to be proud of. 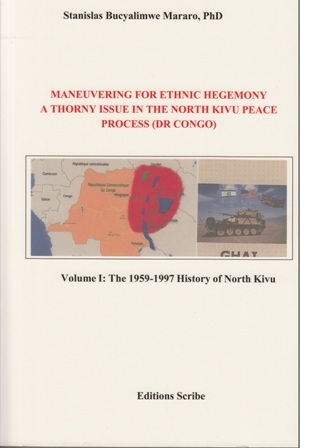 Therefore, one of the main findings is that, in this whole war and peace process, the DRC came out as the biggest loser because its future is being shaped violently by the American, British, and Israeli imperialists through the MONUC/MONUSCO and Hima-Tutsi mercenaries, their hunting and watchdogs in central Africa ». Vers une invasion « ouverte et autorisée » de la RDC par les armées du Rwanda et de l’Ouganda ?